Cleroux Roofing did my roof on June 5th, 2012 while I was at work and had it done and cleaned up before I got home. I had to walk around my house to make sure they did the work, and I was impressed it was all done and so clean as if they weren’t even there.  Cleroux & Sons Roofing came out the same day I called, and not only did they quote the roof on my warehouse, they tarped it for free to keep that nights’ rain out of my building. Great guys. Thanks. Being a large church, I was worried about people getting in and out of our food banks, day cares and offices all week. But, Cleroux Roofing had made it a priority to make a safe and clean walkway, and had it done in 3 days. Very Impressive. Experience our commitment to providing excellent service for yourself. Call us to schedule your own estimate today!